Biofilms, like the one shown here, allow bacteria to adhere to a variety of surfaces, living or nonliving. A recent study by Monica Feng and Steven Distelhorst, graduate students in Balish’s laboratory, sheds light on how biofilms of the bacterium M. pneumoniae organize themselves. Using scanning electron microscopy at 5,000 and 20,000 magnification, the researchers found that “despite their genetic simplicity, these bacteria undergo significant changes in appearance during biofilm maturation,” Feng said. Results showed that the 2-AI compound interfered with growth of M. pneumoniae biofilms, “even though this simplified organism lacks any of the known molecular targets of 2-AIs,” Feng said. Written by Susan Meikle, University News Writer/Editor, University News & Communications, Miami University. Originally appeared as a “Top Story” on Miami University’s News and Events website. Pneumonia image by Yale Rosen via Flickr, used under Creative Commons license. 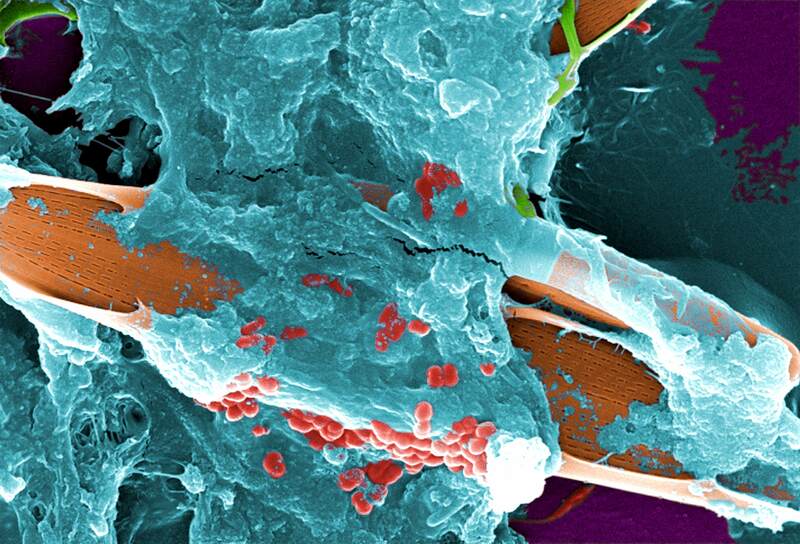 Biofilm image by Janice Haney Carr, United States Centers for Disease Control and Prevention, in public domain. This entry was posted in Research stories and tagged biofilm, microbiology, Mycoplasma pneumoniae, pneumonia, research. Bookmark the permalink.